A fun time was had by all at our meeting this week! We had a spotlight on Angie. There will be a whole post with Angie's quilts later. The fabrics for the MQG Michael Miller Fabric Challenge were handed out. Andrew reminded everyone about the Quilt show happening right now at the Mount Airy Art Garage. 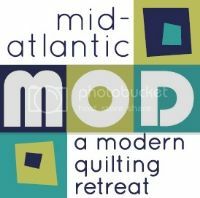 Many of the quilts are Philly MQG member quilts. The show ends this weekend, please go see it if you haven't yet! Andrew will be giving a talk about the Modern Quilt movement at the ArtQuilt Elements show in Wayne on Saturday. Members are invited to come and show their quilts during the talk. Info on the show can be found here. He also had fabric for those interested in creating blocks for Julie Herman, the founder of our guild. The information on block creation is here. You can contact Andrew for the fabric. The charity quilt was brought from the retreat. Big thanks to Bobbi for piecing it and everyone who made a block. Our show and tell had some great quilts! Jordan showed a quilt that her mother made at 14 and never finished. She finished it by hand quilting it! And she had this family quilt she also hand quilted for her mother. Next meeting will be May 20th.